8.12 - Australia, New Zealand, The Netherlands, the Free French, Yugoslavia, Costa Rica, Cuba, El Salvador, Guatemala, and Honduras also officially declare war on Japan, and the Republic of China declares war on the Axis powers. 12. 12 - Independent State of Croatia, Slovakia and Bulgaria declare war on the United States and Britain. 15. 12. - Drina's martyrs: Chetniks killed five Catholic nuns at Gorazde. 16. 12. - Germany Supreme Command ordered to get as much power from Yugoslavia transferred to the Eastern front (mainly 342 and 113 Infantry Division). 17. 12. - Germans and the Chetniks of Kosta Pecanac entered in Lebane (Serbia). 18 - 19. 12. - Požarevački NOP detachment liberated Golubac and Veliko Gradište. 20. 12. - The alleged instruction of Draže Mihailović to the Major Dorđija Lašić and captain Pavle Djuric (in Montenegro): the goal is ethnically pure Great Serbia in the Great Yugoslavia. 21. 12. - The Rudolph, on Stalin's birthday, formed the First Proletarian Strike Brigade. 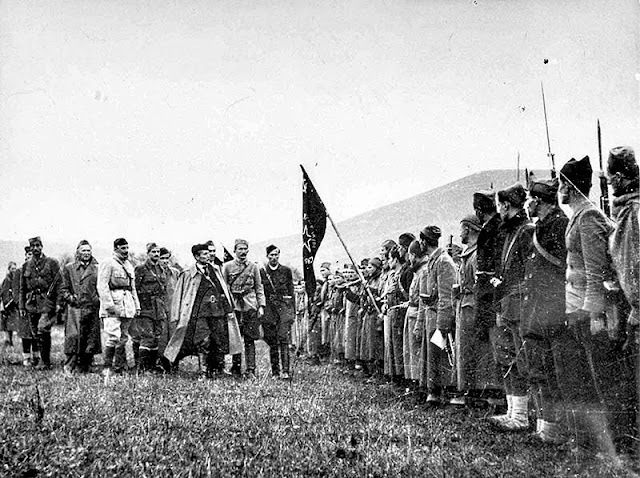 Brigade was formed by the Serbian and Montenegrin unit, under the direct command of the Supreme Headquarters, as the first territorial unit (published on 22 12th, which will be the Day of the Army). 22. 12. - Italians and home guard broke through in blocked Bileca. 28. 12. - At the Chetnik Conference in Vlasenica, the German and Nedić conditions were accepted. 30th 121941 The railroad Raca-Bijeljina parts of Majevica NOP Detachment destroyed the German train.